Water is life and nowhere is that more apparent than in the desert. Fountains and pools of water were built into ancient cities, including desert cities, for both practical and aesthetic reasons. They provided access to water for human needs, to support livestock, to grow food crops and gardens. Water features also cool the air creating microclimates and mitigating noise. They allow city dwellers to experience the relaxing charm of moving water that make fountains natural gathering places. They connect people to a precious, shared resource that is often not top of mind in our modern world. Our desert cities work to strike a balance between the beauty and practicality of fountains. The City of Scottsdale continually weighs people’s attraction to fountains against the need to conserve water and control the cost of energy and maintenance that fountains demand. The city has 21 decorative fountains, down from the 32 the city maintained before 2008. Scottsdale has removed eight and shut off the water to three. Scottsdale has saved an estimated 830,000 gallons of water a year by initiating these changes to its fountains. 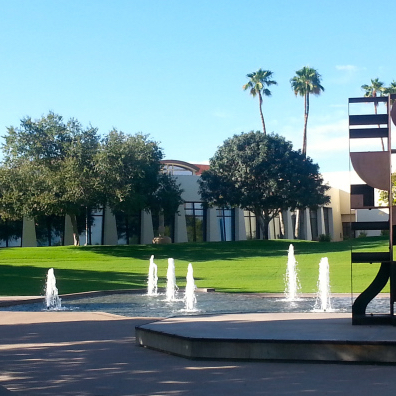 Here are some of the ways Scottsdale has been able to maintain its most enjoyed water features. In 1999, the City of Scottsdale began installing small water meters on every fountain. The meters allow the city to monitor water use, immediately find leaks and determine overflow. This sub-metering also helps the city to estimate how much water a proposed fountain would demand before approving it. Nearly 100,000 people gather annually near the fountains and lagoon in front Scottsdale’s Civic Center Mall to enjoy festivals and concerts. The Mall’s 7-foot deep lagoon was an enthralling water feature with fish and swans, but it used a great deal of water and was difficult to maintain. In 2008, the city raised the lagoon to a depth of 3.5 feet, reducing the volume of water it held by 550,000 gallons, and added a filtration and automated treatment system to the water feature to reduce maintenance. Every fountain in Scottsdale now has a filter and automated treatment system, similar to systems used in commercial swimming pools. An employee regularly skims and cleans the fountains using portable and automatic vacuums, reducing the number of times the filter needs to be backwashed and saving water. In the past, backwashing happened every week, but now the city backwashes fountain filters only when needed. The added benefit: A partially dirty filter traps smaller suspended particles creating clearer water for the fountain. The employee who cleans the fountains uses brooms and leaf blowers to clean around the fountains instead of a hose. An art installation called Horseshoe Falls Fountain on the corner of Marshall Way and Indian School Road creates fog as its water flows. During the first month of its installation this popular piece of public art used 50,000 gallons of water. The city curtailed the fog to two minutes at the top of peak hours and added a button that allows people to view the enticing fog for 30 seconds. These changes reduced the fountain’s water consumption to 1,500 gallons a month. The technology that created both simple and spectacular fountains around the world freed people from the need to live close to natural rivers, lakes or streams. Fountains helped to create cities. Now cities are working to keep water as part of their art and architecture while making fountains as water-efficient as possible. If you have a fountain or water feature in your yard, you can get help to make sure it’s operating efficiently by calling your city's conservation professional.